He is Jack M. Guttentag, now Professor of Finance Emeritus, formerly Jacob Safra Professor of International Banking, at the Wharton School of the University of Pennsylvania. Earlier he was Chief of the Domestic Research Division of the Federal Reserve Bank of New York, on the senior staff of the National Bureau of Economic Research, and managing editor of both the Journal of Finance (1974-77) and the Housing Finance Review (1983-89). In 1997 Professor Guttentag began to phase out his teaching at Wharton to focus his efforts more fully toward helping consumers navigate the home loan market effectively. He began a weekly column on mortgages that is nationally syndicated, and began the development of this web site. The major purpose of both is to help consumers make better decisions. He published The Pocket Mortgage Guide in 2003 and The Mortgage Encyclopedia in 2004, with a second edition in 2010; all were published by McGraw Hill. 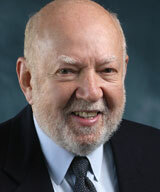 In 2000, Professor Guttentag in collaboration with several mortgage brokers developed Upfront Mortgage Brokers (UMBs). Brokers who agree to do business in accordance with UMB principles, and who display these principles prominently on their web sites, were listed on this site for easy access by consumers. In 2006, Professor Guttentag transferred all his intellectual property connected to UMBs, including trademarks, to the Upfront Mortgage Brokers Association (UMBA), a non-profit corporation. The professor is chairman of the board of UMBA, an unpaid position.